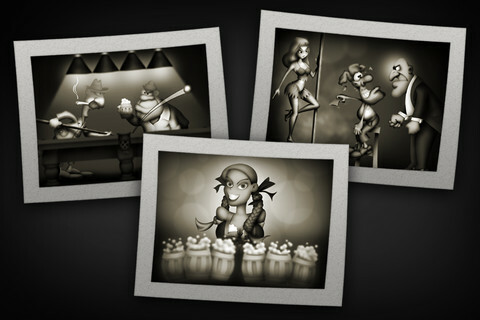 Quick Bob – Drink a beer, catch a bite to eat, tip the dancers and dodge flying billiard balls. The controls are simple in this deceptively addictive arcade game produced by Dosware LLC. You are Bob, a guy out to have a good time with your buddies when you are abandoned by them. That is okay with you because there is plenty to keep your attention in the bar. Though there is an attempt at a backstory, the story is really irrelevant to the gameplay. The goal of Quick Bob is simple – stay on your barstool. You are given four control arrows, two to the left and two to the right. The help screen explains the controls, but once you enter the game, no explanation is really necessary. There are multiple difficulty levels available to be unlocked upon reaching particular high scores, and each level is increasingly faster paced than the prior. Much to its credit, for such a simple arcade game, the artwork in Quick Bob is stunning and worthy of praise. The graphical design truly rivals some of the best games available in the iTunes app store. 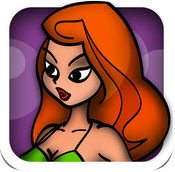 The gameplay is smooth and the animations render well on both the iPod and iPad devices. A word of caution for parents. Be advised that Quick Bob does contain suggestive themes and users are required to affirm that they are 17 or older prior to download. Quick Bob is a free download for both the iPod and the iPad, and is an interesting way to kill time, especially if you’re waiting for your own friends to meet you at the pub. Quick Bob is compatible with iPhone, iPod touch, and iPad.Requires iOS 4.0 or later.